There were a few somber moments at the Permanently Disabled Jockeys Fund’s karaoke fundraiser when Jockey Guild president John Velazquez, riders Edgar Prado and Dean Mernagh and honoree Jeremy Edge, the “Walking Brit” who raised $30,000 for charity by walking from Belmont to Saratoga, paused the madness to remind the several hundred people in attendance of how quickly an athlete’s life can change when an accident occurs while riding a horse. 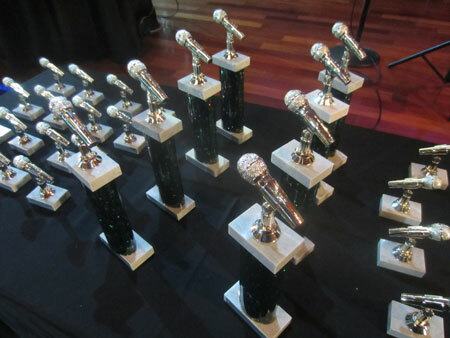 Microphone trophies distributed to 21 jockey contestants in the karaoke competition. Otherwise, the late-into-the-early-morning-hours evening was the smiley-est event of the Saratoga social season so far. The Belmont Child Care Association’s party is tonight and the Travers Celebration takes flight on Thursday evening. Yet, neither event will have Tom Durkin spitting out pithy zingers as emcee or media celebrities casting scores and opinions a la Simon Cowell (“It’s really hard to sing that song while chewing gum”) or, most notably, the fun. Jockey karaoke contestants take to the stage for a curtain call. The Vapor Night Club, where the karaoke contest was held, is normally a boîte de nuit for self-conscious lotharios and cougars, faux swanky in its curves and blue neon. Yet, the jockeys appeared capriciously on stage in a do-rag (Mike Luzzi singing “Born to Be Wild”); tube top, jeggings and blonde wig (Maylan Studart doing “You’re the One That I Love”) and dreadlocks (Rajiv Maragh and Alan Garcia groaning mercilessly through Neil Diamond’s “Red Red Wine”). Mernagh’s spirited finale of “New York, New York” brought the house up – in other words, a standing ovation resulted. Nancy LaSala, the PDJF president whose husband Jerry, a professional jockey for nearly 30 years that has miraculously escaped the plight she’s been trying to mitigate, commanded a flight of worker bees. Hall of Fame jockeys Jerry Bailey and Jose Santos, Jr. and trainers Chad Brown, David Donk and Tom Voss were spotted in the audience. One audience participant, in particular, had 45,000 reasons besides the occasion to celebrate. Barry K. Schwartz, the former chairman of NYRA, saw his New York homebred filly Lovely Lil win the $75,000 Union Avenue Stakes a few hours earlier. Speaking of dressing the part, Sheryl Schwartz, the owner’s wife, wore two-inch platform, brown leather lace-up boots with spiked heels to the paddock and winner’s circle that were killer. Unlike the jockeys who looked like singers but couldn’t sing, Schwartz has the gams to flatter such boots and could walk gracefully in them. Behind every great woman there stands a great man. Barry Schwartz in gray trousers and bespoke black shoes. Last Saturday, wearing canary yellow diamond earrings, Schwartz entertained Calvin Klein’s Francisco Costa at the races in a vivid coral shift that Costa designed. The weekend before, she treated Kevin Dillon and Kevin Connolly of HBO’s “Entourage” to feast their eyes on her in another breathtaking outfit. Recently, Women’s Wear Daily described Schwartz as a doyenne. She’s not. She’s a rocket ship. 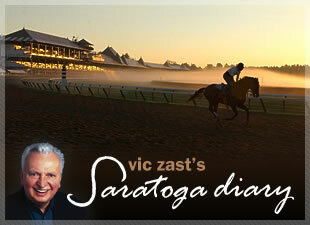 Saratoga’s construction boom just won’t go away. A new gazebo, blocking the paddock view for some Shake Shack customers, has been erected. Who uses the private playhouse? “If you lay enough money down, you can get it,” claimed a smoky-voiced woman named Liz, taking a cigarette break from her handicapping. There are two more gazebos to be built, it’s been said.